Well more trouble for iPad users. If iPad neck wasn’t enough, now you’ve got to contend with iPad allergies. 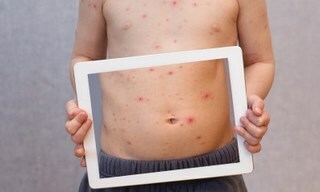 Yup, you got that right—iPads are causing allergies in some users. And before you think your Kindle or cellphone is off the hook, all new tablet/phone technology is being implicated, even laptops. Doh! According to recent reports in medical journals, nickel used in the outer casings of various electronic devices can cause an allergy in some people. Nickel—one of the most allergy inducing metals—can cause uncomfortable skin rashes, like that which happened to an 11-year-old boy who used an iPad daily, as reported in the recent issue of Pediatrics. His rash was throughout his whole body, and although he has a known condition causing scaly skin, this particular rash did not go away prompting the skin testing. It turns out that diagnosed nickel allergies—as determined by skin testing—are on the rise. According to national data, about 25 percent of children who get skin tested have allergies to nickel, versus about 17 percent a decade ago. Fortunately, nickel allergies are not life threatening and can be treated with steroids (or iPad use discontinuation…er, scratch that). Not everyone has to worry about nickel allergies, however. If you are, in fact, allergic to nickel but don’t know it yet, you will get a reaction from contact with nickel anywhere from minutes to never. According to to an advisory about cellphones on the website of the Nickel Institute, a global association based in Toronto representing nickel producers, the risk arises from contact with nickel-plated outer surfaces “over prolonged periods of time,” so again, a protective cover seems the simplest method for prevention. “The length of time required to elicit an allergic reaction will vary from 5 or 10 minutes to never, depending on the sensitivity of the individual,” the advisory says. And a nickel allergy rash doesn’t have to come from electronic devices; it can also develop from jewelry, eyeglass frames and zippers. So if you have developed an unexplained rash you might want to get skin tested for nickel allergies. And, of course, doctors need to be on the alert for this uncommon, but growing, condition. Yes, our modern conveniences are godsends, but remember that nothing comes without its downside; and for our mobile computing devices, looks like nickel allergies are at least one…for now.